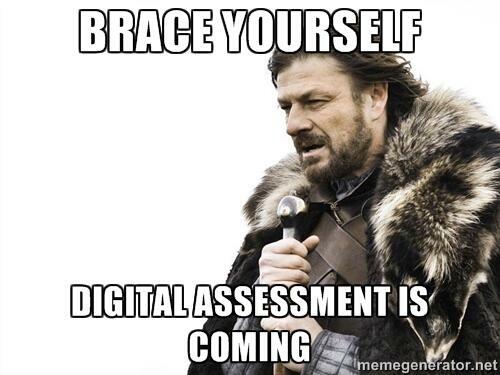 Yes, I have no doubt that digital assessment is coming. However..
As a school starting BYOD this year we have looked at a number of schools who are already running BYOD programmes. Even the Auckland school’s where every student has an i-pad/laptop still do one subject, Mathematics, on paper. This is not to say that they do not use the devices in Maths, but the difficulty/time of writing Algebraic statements on an electronic device is just too much. Until you have a stylus that can write on a screen easily I do not see it as either feasible or fair to expect students to work in one mode all year then be assessed in another. Multi choice will not cut it as the standards explicitly state that clear evidence of thinking should be displayed. It will be interesting how this plays out. I agree Murray. I agree with NZQA that from a logistical perspective the MCAT is the obvious choice to trial, but I’m still confused about how it’s the best choice content-wise. It will be very interesting indeed how it plays out!